In 1962 five ships wrecks was found in Roskilde Fjord. This is the reason for Roskilde today being a centre of marine archaeology in Denmark. 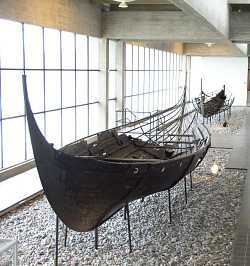 A museum was build for the five Viking ships and since then the facilities has been enlarged many times. Today it is not only a museum but a marine historical centre with its own ships yard and harbour hosting many kinds of ships. The jewel of this centre is still the five Skuldelev wrecks at the museum and they often are models when new Viking ships are build in Denmark or other countries. As special gift from the past the five ships are completely different and clearly shows the wide span of abilities for ships builders in the Viking age. This is a trading ship for travelling in open sea. Probably the type of ship the Vikings called Knarr and it might be this kind of ships they used for sailing to Greenland and North America. In the museum harbour outside the museum it is possible to see the full size reconstruction Ottar build by the Viking Ship Museum. A Norwegian reconstruction of Skuldelev 1 has once been crossing the Atlantic Ocean and visiting North America. 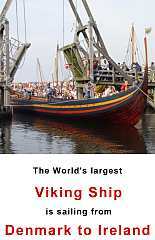 This warship has become the most famous of the Viking ships from Skuldelev. 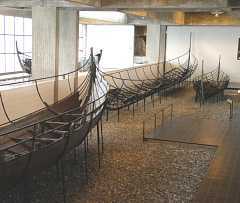 A longship 30 meter long. Able to host more than 80 warriors. This is the kind of ship Danish and Norwegian Vikings used for attacks on England and France. When the wrecks were found the archaeologists thought they found two ships and they named the ships number 2 and 4. Only later they found out that it was all from one very long ship and there was no ship number 4. For this reason this ship is often named "Skuldelev 2-4". Research has shown that the ship was build in Ireland in the year of 1042. In 2004 The Viking Ships Museum launched a full size reconstruction of the ship by the name "The Sea Stallion from Glendalough". In 2007 the ship will do the journey back to Dublin where the original Skuldelev 2 was build. Ship number 3 is probably the most reconstructed Viking ship in the World. 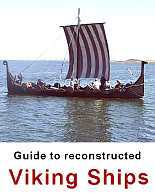 Both professionals and amateurs has copied it or been inspired by it when building new Viking ships. One of the reasons is that the size is easier to handle but it has also been an argument that more of the ships is restored from this ship than any of the others. The Viking Ship museum has reconstructed Skuldelev 3 under the name of Roar Ege. It also can be seen in the harbour near the museum. This a smaller longship. A warship for the inner waters of Denmark. Also this ship has been copied several times. At least four times reconstructed in Denmark. Also the town of Catoira in Spain has a reconstruction of this ship. 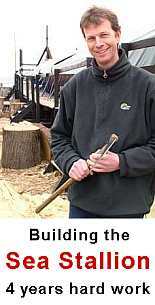 The Viking Ship Museums own reconstruction Helge Ask has done several journeys among them a visit to Paris in France. Is a smaller boat for fishing and transport on shorter distances. Like Skuldelev 1 it was build in Norway and there are reasons to believe, that it has even been build by the same ship builders. The Viking Ship Museum has many special exhibitions and events during the season. 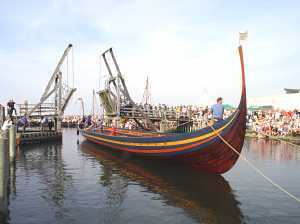 Some time it is even possible to enter some of the reconstructed ships and sail with them on Roskilde Fjord.